Vancouver International Airport is one of the busiest and most internationally awarded airports in North America. We were tasked to help them devise a social media strategy and build out a digital community in advance of the Vancouver Olympics. Working with their communications team, YVR and M2O collectively developed a training regimen to onboard their communications team within social media channels, creating a boot camp and developing a digital strategy that garnered them an international airport award. 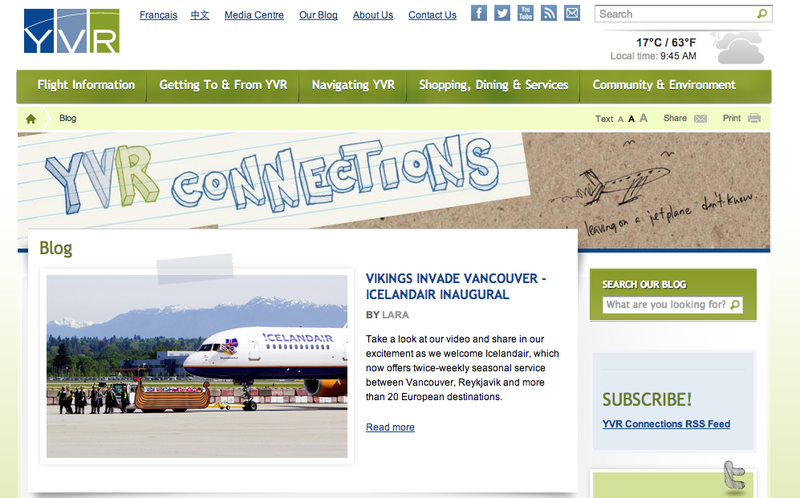 The site used videos, photos and real-world stories to form a bond with the local and international communities, engaged the media, and helped bring 21st century marketing to YVR and continues to evolve and serve the community.